A sensor is a device that detects events that occur in the physical environment (like light, heat, motion, moisture, pressure, and more), and responds with an output, usually an electrical, mechanical or optical signal. The household mercury thermometer is a simple example of a sensor - it detects temperature and reacts with a measurable expansion of liquid. Sensors are everywhere - they can be found in everyday applications like touch-sensitive elevator buttons and lamp dimmer surfaces that respond to touch, but there are also many kinds of sensors that go unnoticed by most - like sensors that are used in medicine, robotics, aerospace and more. Traditional kinds of sensors include temperature, pressure (thermistors, thermocouples, and more), moisture, flow (electromagnetic, positional displacement and more), movement and proximity (capacitive, photoelectric, ultrasonic and more), though innumerable other versions exist. sensors are divided into two groups: active and passive sensors. Active sensors (such as photoconductive cells or light detection sensors) require a power supply while passive ones (radiometers, film photography) do not. Where can sensors be found? Accelerometers: Micro Electro Mechanical technology based sensors, used mainly in mobile devices, medicine for patient monitoring (like pacemakers) and vehicular systems. Biosensors: electrochemical technology based sensors, used for food and water testing, medical devices, fitness tracker and wristbands (that measure, for example, blood oxygen levels and heart rate) and military uses (biological warfare and more). Image sensors: CMOS (Complementary Metal-Oxide Semiconductor) based sensors, used in consumer electronics, biometrics, traffic and security surveillance and PC imaging. Motion Detectors: sensors which can be Infrared, Ultrasonic or Microwave/Radar technology. They are used in video games, security detection and light activation. Graphene is a two-dimensional material made of carbon atoms, often dubbed “miracle material” for its outstanding characteristics. It is 200 times stronger than steel at one atom thick, as well as the world’s most conductive material. It is so dense that the smallest atom of Helium cannot pass through it, but is also lightweight and transparent. Since its isolation in 2004, researchers and companies alike are fervently studying graphene, which is set to revolutionize various markets and produce improved processes, better performing components and new products. Graphene and sensors are a natural combination, as graphene’s large surface-to-volume ratio, unique optical properties, excellent electrical conductivity, high carrier mobility and density, high thermal conductivity and many other attributes can be greatly beneficial for sensor functions. The large surface area of graphene is able to enhance the surface loading of desired biomolecules, and excellent conductivity and small band gap can be beneficial for conducting electrons between biomolecules and the electrode surface. Graphene is thought to become especially widespread in biosensors and diagnostics. The large surface area of graphene can enhance the surface loading of desired biomolecules, and excellent conductivity and small band gap can be beneficial for conducting electrons between biomolecules and the electrode surface. Biosensors can be used, among other things, for the detection of a range of analytes like glucose, glutamate, cholesterol, hemoglobin and more. Graphene also has significant potential for enabling the development of electrochemical biosensors, based on direct electron transfer between the enzyme and the electrode surface. Graphene will enable sensors that are smaller and lighter - providing endless design possibilities. They will also be more sensitive and able to detect smaller changes in matter, work more quickly and eventually even be less expensive than traditional sensors. 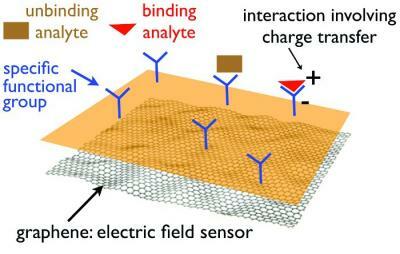 Some graphene-based sensor designs contain a Field Effect Transistor (FET) with a graphene channel. Upon detection of the targeted analyte’s binding, the current through the transistor changes, which sends a signal that can be analyzed to determine several variables. Graphene-based nanoelectronic devices have also been researched for use in DNA sensors (for detecting nucleobases and nucleotides), Gas sensors (for detection of different gases), PH sensors, environmental contamination sensors, strain and pressure sensors, and more. In June 2015, A collaboration between Bosch, the Germany-based engineering giant, and scientists at the Max-Planck Institute for Solid State Research yielded a graphene-based magnetic sensor 100 times more sensitive than an equivalent device based on silicon. In August 2014, the US based Graphene Frontier announced raising $1.6m to expand the development and manufacturing of their graphene functionalized GFET sensors. 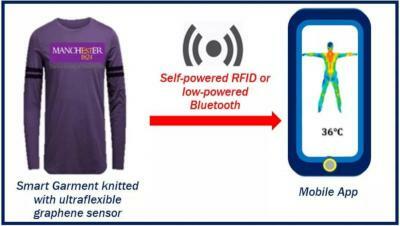 Their “six sensors” brand for highly sensitive chemical and biological sensors can be used to diagnose diseases with sensitivity and efficiency unparalleled by traditional sensors. In September 2014, the German AMO developed a graphene-based photodetector in collaboration with Alcatel Lucent Bell Labs, which is said to be the world’s fastest photodetector. In November 2013, Nokia’s Cambridge research center developed a humidity sensor based on graphene oxide which is incredibly fast, thin, transparent, flexible and has great response and recovery times. Nokia also filed for a patent in August 2012 for a graphene-based photodetector that is transparent, thin and should ultimately be cheaper than traditional photodetectors. 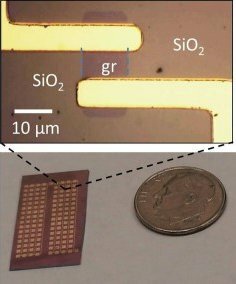 Researchers in the University of Minnesota College of Science and Engineering have developed a unique new device using graphene that provides the first step toward ultrasensitive biosensors to detect diseases at the molecular level with excellent efficiency. Ultrasensitive biosensors for probing protein structures could greatly improve diagnosis of a wide variety of diseases extending to both humans and animals. These include Alzheimer’s disease, Chronic Wasting Disease, and mad cow disease—disorders related to protein misfolding. Such biosensors could also lead to improved technologies for developing new pharmaceutical compounds. Researchers at Tsinghua University designed graphene-based e-tattoos that act as biosensors. The sensors can collect data related to the user's health, such as skin reactions to medication or to assess the degree of exposure to ultraviolet light. 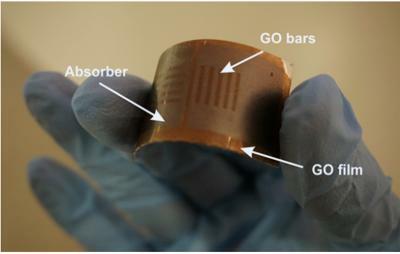 The use of graphene aids the collection of electric signals and also imparts material properties to the sensors, allowing them to be bent, pressed, and twisted without any loss to sensors functionality. The new sensors have reportedly shown – via as series of tests – good sensitivity to external stimuli like strain, humidity, and temperature. The basis of the sensor is a material matrix composed of a graphene and silk fibroin combination.